If the blackbird has come into your life, you are in for a very productive spring and summer, as those are the blackbird’s most productive times of year. You will surely be able to deepen your connection with nature. You also may have an unexpected surprise. The blackbird takes about 12 days to build a nest, and it is the female who seeks out a proper nesting site and is then followed by her community. This bird reminds us of female leadership and cycles of productivity. Really – twelve days is enough time to accomplish quite a nest indeed. Its time for an action plan, and ladies – lets lead the way for a moment here, especially in decisions regarding a proper place to nest. Blackbirds also have incredibly varied eggs, likely for reasons of camouflage. This signifies that your creations can be varied or even obscure, and that variety will bring better results. Finally, we have the ever-present mysteries signified in the iridescent black of this sky dweller. Blackbirds are complex and cryptic messengers that signal profound growth in acceptance of the light and the dark, and alchemical abilities to transform your experiences, making gold from base metal, or making positive vibrations from ambiguity and doubts. 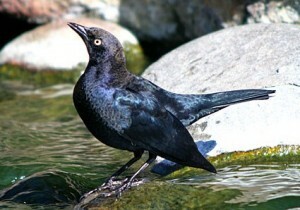 The blackbird brings much knowledge, and will communicate directly with you are you are ready to receive its wisdom.